‘Doughnut’ say “no” to residents’ requests! Recently one of our residents, Tillie, has been losing weight and not feeling well. It has come to a critical point that we needed to take some drastic measures or she would not be able to stay in our community. Tillie was saying that she was cold. Heidi, the general manager, told her that “It is because you are too skinny you need ‘winter fat’ to keep warm!” Tillie answered, “You never have anything good to eat to make me fat!” “Well, what would you like to eat?” The GM replied. Tillie said, she would start eating more if someone would make her chocolate covered donuts. Lunchtime came, and we discussed it in the care partner room, Someone said, “How can we get Tillie fat? She says that she really wants donuts.” Someone said ‘We should go to Tim Hortons.” Someone asked, “Who’s going to Edmonton to go to Krispy Kreme? Lucille, the housekeeper, jumped in and said, “We should make them here!” Lucille was feeling so empowered. 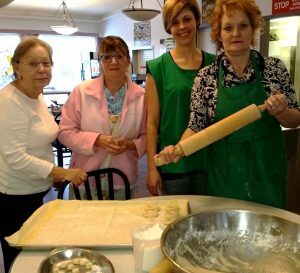 The next morning Lucille had the dough made and ready to start rolling out before 9:00 a.m. It was a wonderful group effort to pour more love into fattening up the donuts. Care partners Heidi and Kara along with Delores, a resident, came into the dining room and helped Lucille start rolling and cutting them out. Delores was in charge of putting them onto the trays to start rising. 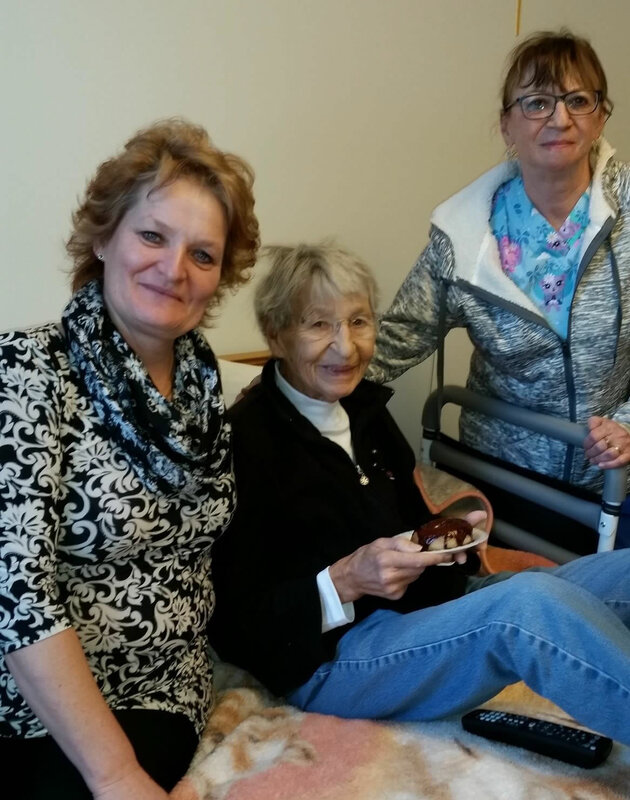 The donuts were all deep fried before 11:00 a.m. and the chocolate glaze was poured onto warm donuts and delivered with smiles to a happy and excited resident, who has started coming out to eat meals with the community and has become more social and checking what our snacks are. Since the Bistro has opened, she comes to make more yummy coffees and hot chocolates. She may not be putting on hundreds of pounds, but baby steps are better than zero pounds! 'Doughnut’ say “no” to residents’ requests!